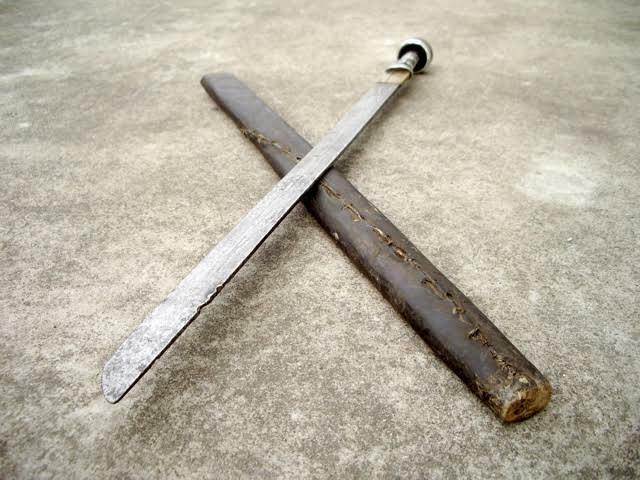 This type of sword is referred to as zhibeidao (直背刀) or simply zhidao (直刀) meaning "straight backed dao " or "straight dao ", where dao refers to anything single edged in the Chinese culture. The first Chinese single edged swords were zhibeidao , until curved sabers were introduced into China by steppe nomads like the Mongols. 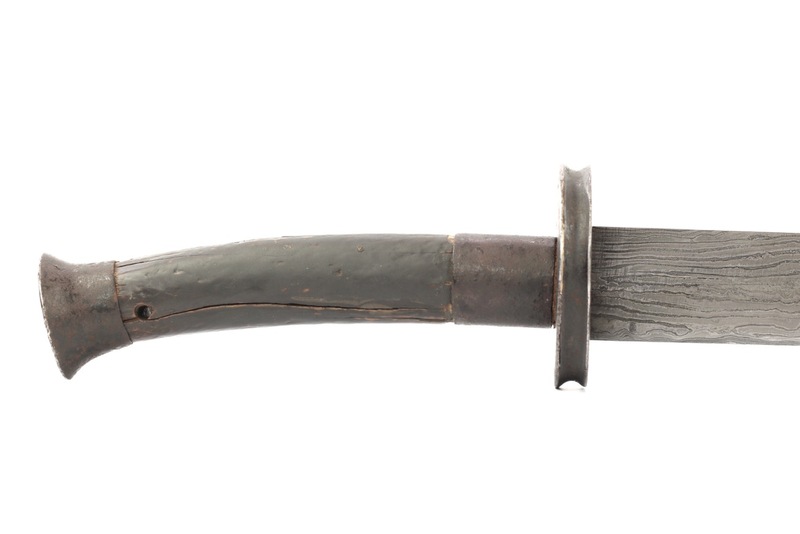 The only places where the curved saber didn't completely replace these older straight styles were on the western fringes of the empire, mainly in Tibet, Sichuan and Yunnan. 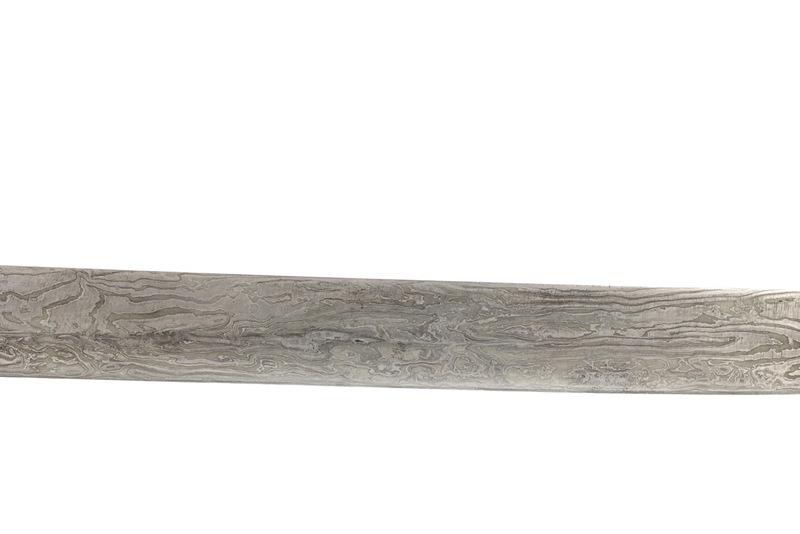 A zhibeidao much like Tibetan examples is also still the national sword of Bhutan. 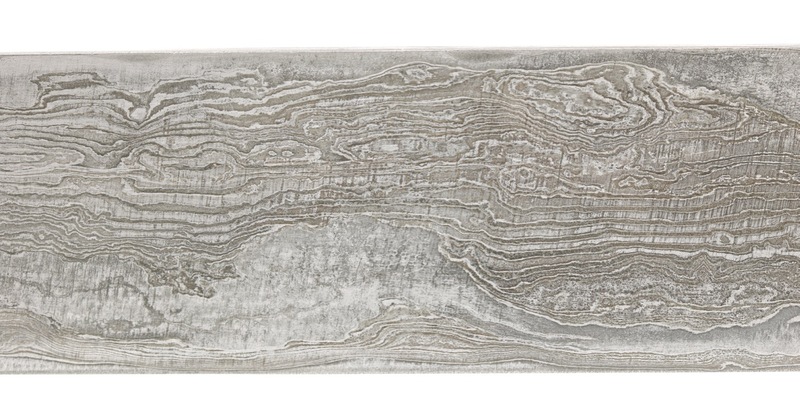 Origin: Western China, possibly Yunnan. Materials: Steel, iron, wood. 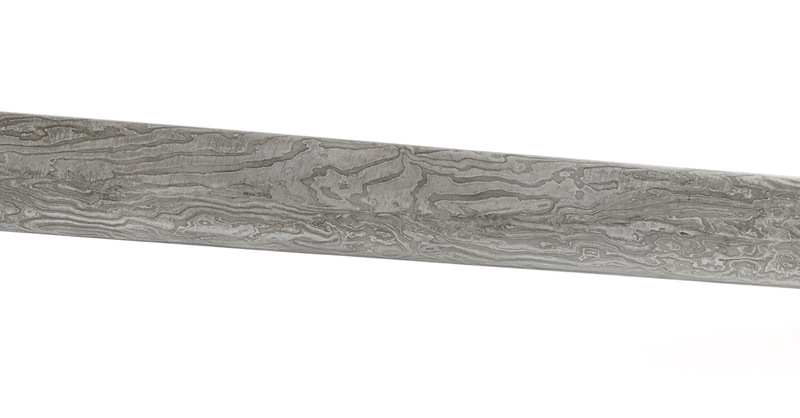 Scabbard: Wood, leather, copper. 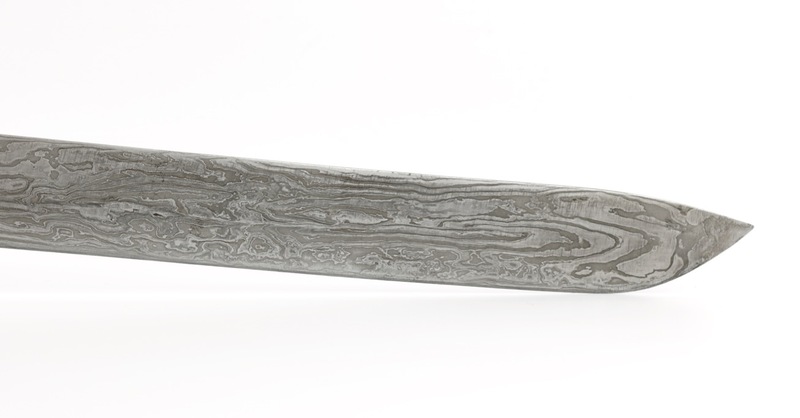 The subject of this article is a highly unusual zhibeidao , with a striking blade with elaborate pattern welding brought out in relief by means of a strong etch. The pattern is a highly complex variation of Tibetan hairpin forging, taking the conventional pattern here and there and with alternations of much more complex layering. Each side is different, with more bold layering on the right side and some patches of an incredibly fine structure alternated with fine, straight lines on the left side. 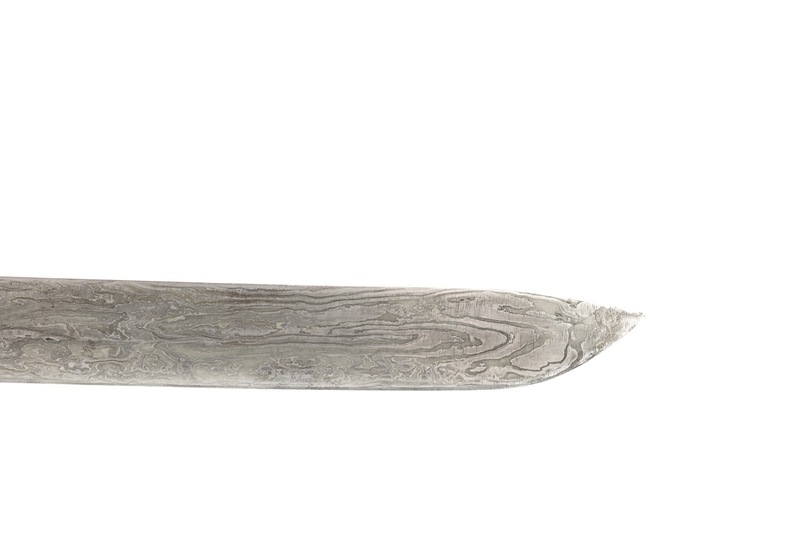 The blade's spine drops down near the tip, a feature common on smaller knives found in trousse sets, but hardly seen on full length zhibeidao . Blade in excellent condition, no nicks, cracks or pitting. 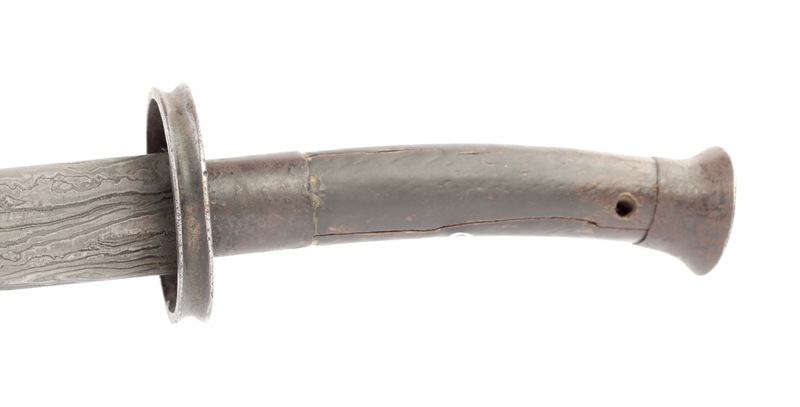 The handle shows strong Chinese influence with downward curving grip as found on standard pattern Qing military sabers, where most zhibeidao tend to have straight handles. 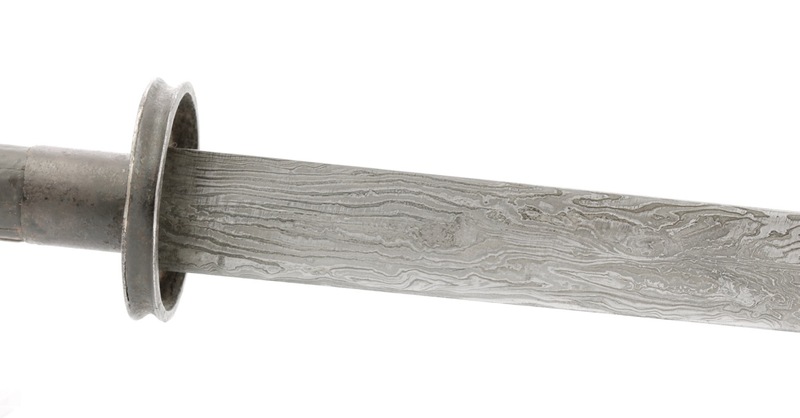 The handle has a round cross-section, where Tibetan zhibeidao and early Qing sabers would have an angular cross-section. Later Qing sabers would have a more oval cross-section. The guard is typical, with hollow rim, resembling a spool. The round, strongly flaring pommel looks much like Chinese angular pommels of the 17th and 18th century in profile, with the important difference that it flares to all sides, and is completely circular when looked upon from the top. 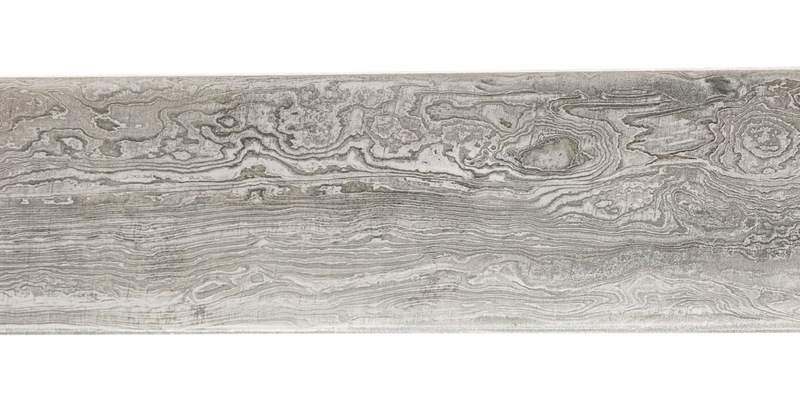 The ferrule is long, echoing the length of Tibetan ferrules yet not their angular cross-section. The grip is made of lacquered hardwood, suggesting it was probably never wrapped. 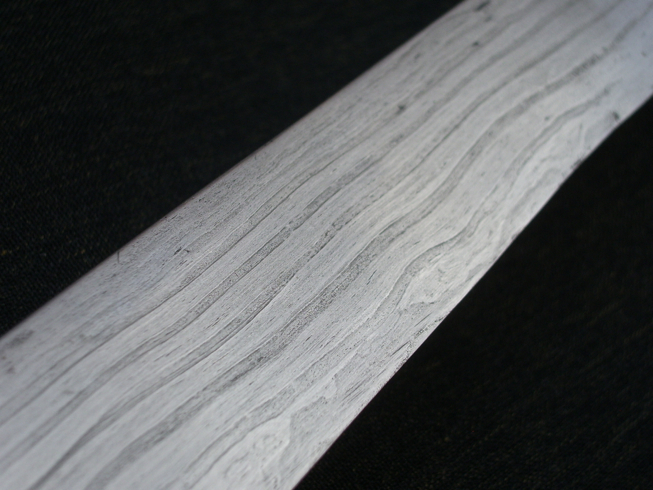 The wood had shrunk over time, resulting in splitting of the grip. As a result, there is also some movement in the fittings. No recent repairs, save for a piece of leather inserted between guard and ferrule to keep the guard from rattling. 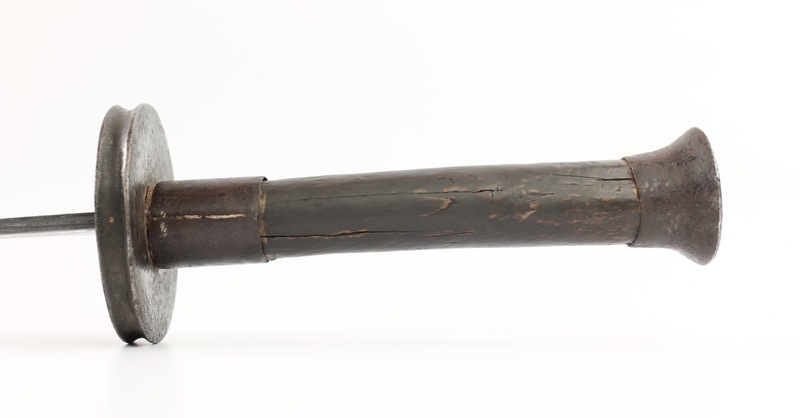 Original handle peening is intact.The iron hilt fittings are all covered with remains of black lacquer. The parts are soldered together using copper, in a fashion reminiscent of Tibetan work. 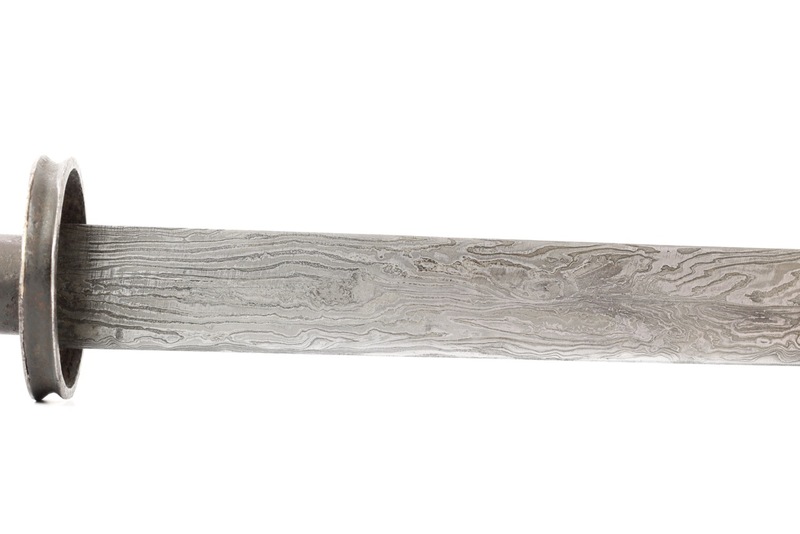 The wooden scabbard is covered entirely with rawhide, tied together on one side with a long strip of hide. The scabbard mouthpiece is also covered, hiding a copper plate in the scabbard's mouth. I've seen scabbards of very similar construction on zhibeidao of the Yi people (a.k.a. "Lolo"). A very rare Yi zhibeidao that I owned many years ago. 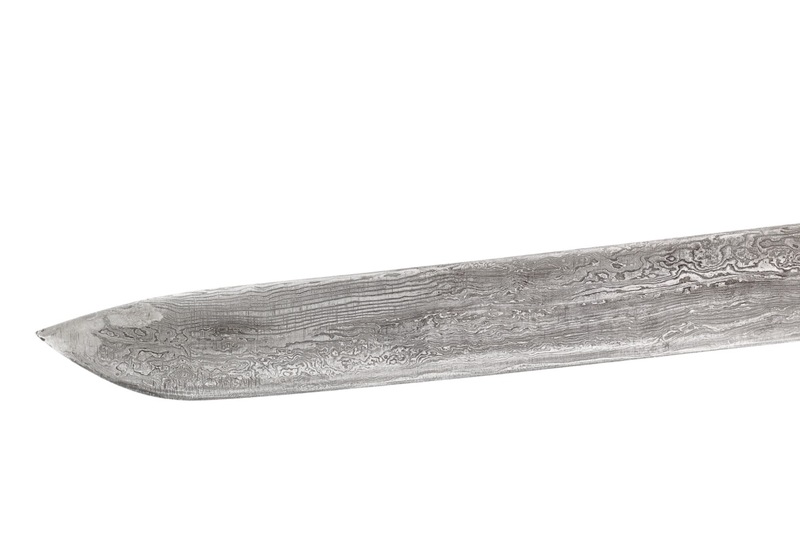 Note the scabbard construction. A. )> An interesting niuweidao in the Metropolitan Museum. 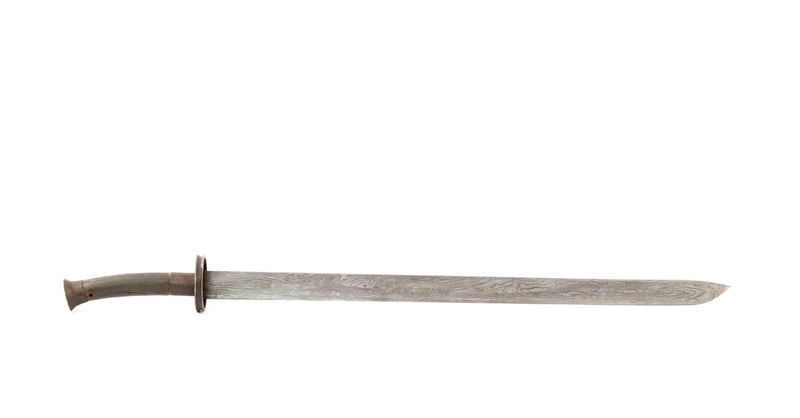 Accession number: 36.25.1477a, b The sword was described in detail in Philip Tom's Some notable sabers of the Qing dynasty in the Metropolitan Museum of Art. 1. 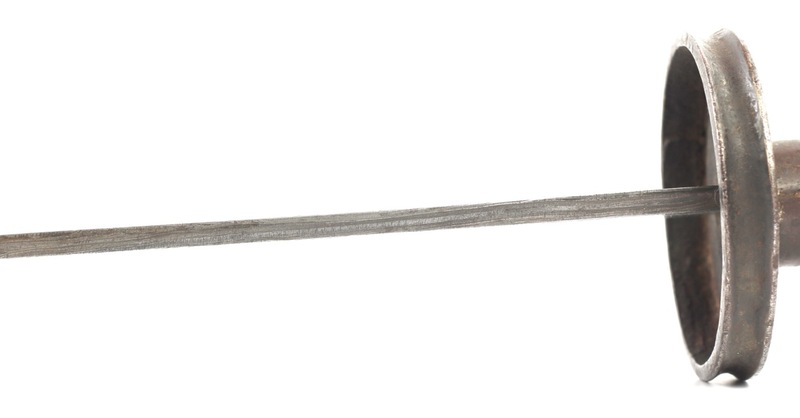 Spool-shaped guard with deeply grooved rim, identical to the current example. 2. Iron fittings covered with black lacquer. 3. 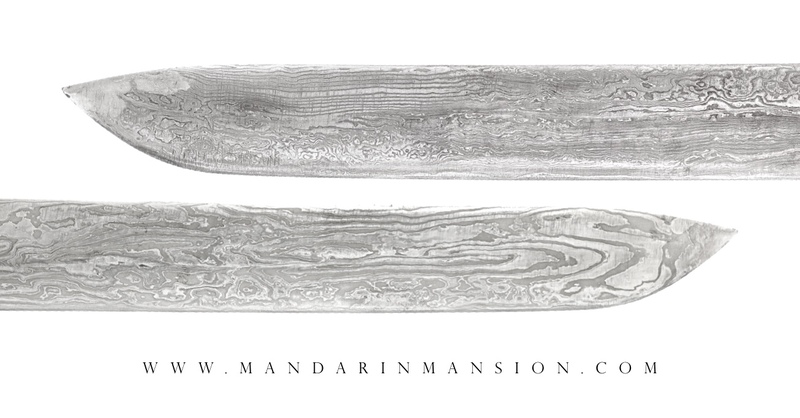 An intricate pattern in the blade, brought out to a relief by an unusually deep etch for arms from the Chinese cultural sphere. The subtle swelling in the tip on our example, only noticeable when looking along the spine. B.) A short saber with horse-tooth pattern I've previously owned. Features on Philip Tom's restoration page. 1. Spool-shaped guard with grooved rim. This time more subtle and executed in brass. 2. 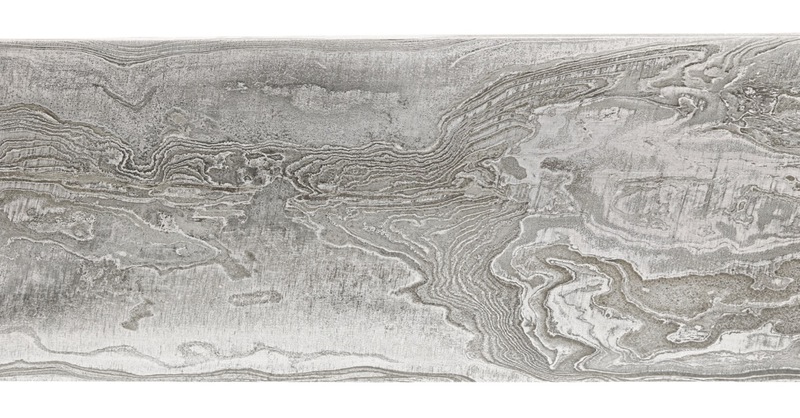 An intricate pattern in the blade, combining horse-tooth edge construction combined with more typical Tibetan hairpin forging. Original condition suggested it was also once deeply etched. C.) A Tibetan style zhibeidao I've previously owned. Sold here. 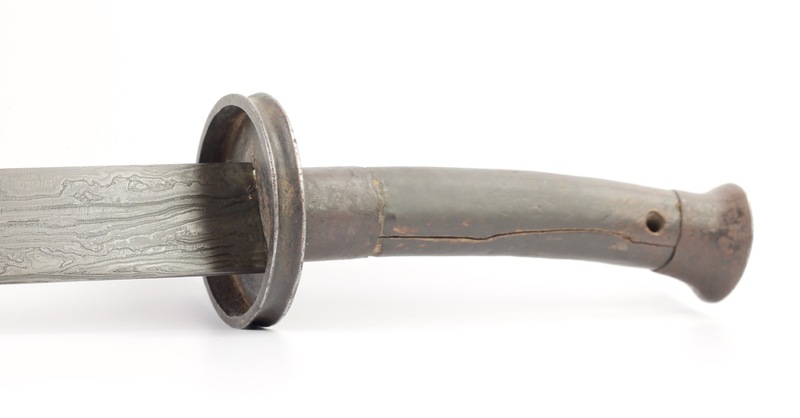 I now know that this pommel profile is rather typical for swords made in the Jinchuan region in Sichuan. 1. Forging reminds strongly of Tibetan hairpin forging, but of much finer construction than usual and brought out by an unusually deep etch. Of this group, the current example shares some strong Tibetan features with B. and C. and at the same time the spool-shaped guard is so close to A. that they are probably strongly related. 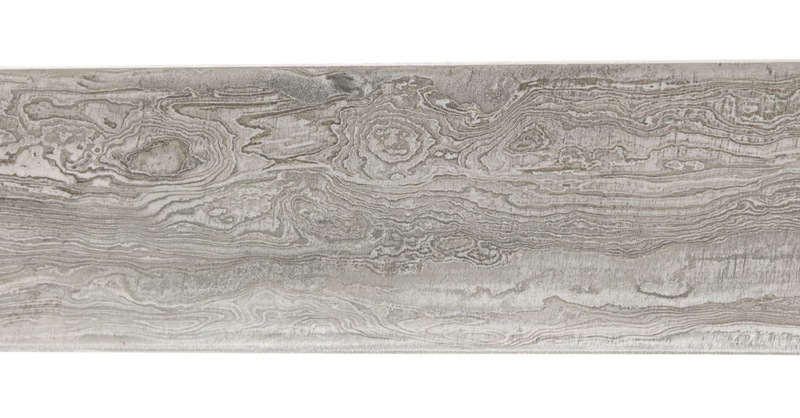 All pieces have one thing in common, which is a blade forged with a rare elaborate pattern. The fitting styles vary widely, from rather Chinese to typically Sichuanese or Tibetan, but for the most part are rather humble compared to the quality of their blades, almost as if to let the blade speak for itself. 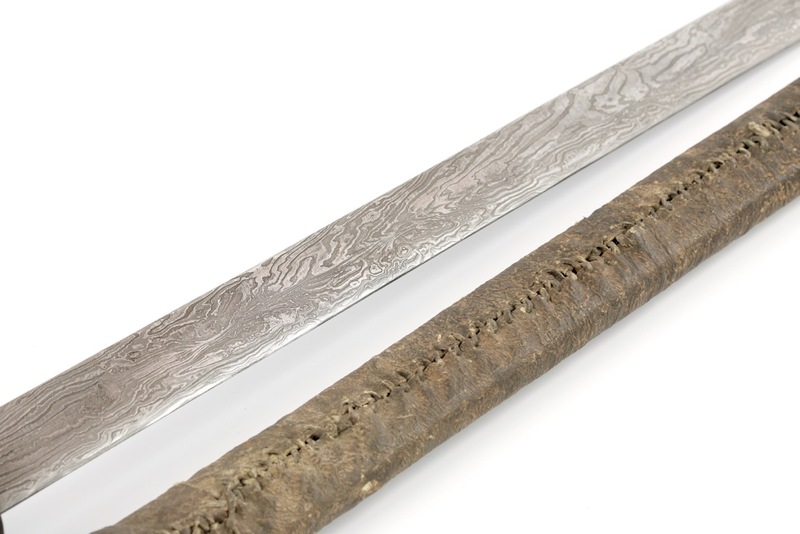 The scabbard on the current example is made in a way reminiscent of scabbards from the Yi minority that among others live in the mountainous regions of Sichuan and Yunnan. The Kachin hills are landlocked in northern Burma (present-day Myanmar) and share a long border with Yunnan. 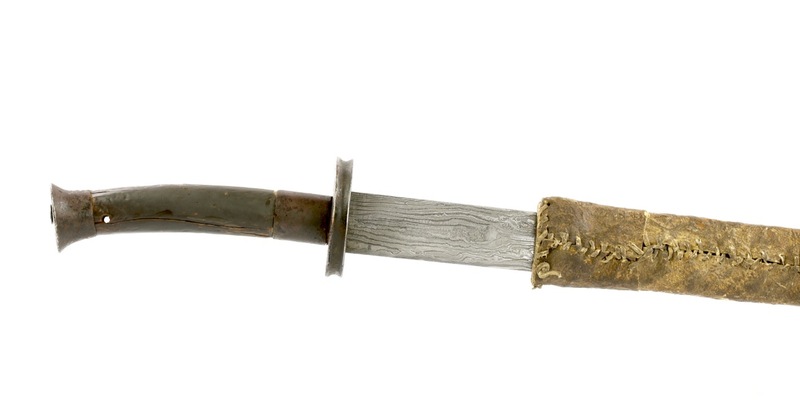 Any imported dha (sabers and knives) most likely came from Yunnan. This is significant because it tells us that there was large scale production in Yunnan catered to a foreign market, creating weapons in a foreign style. Gao Lian, a Ming scholar and art collector and connaisseur wrote in his Eight Discourses on the art of living (1591) that having a sword in one's study was good practice. An antique was preferred, but: "for those who cannot afford an antique sword for their study, modern-made ones from Yunnan are acceptable." . This interestingly implies that the swords from Yunnan were considered notably better, for unknown reasons, than those produced in the east of China, that place associated with Chinese high-culture. Gao Lian is known to have retired in Hangzhou, a city known for the high level of sophistication of its scholarly scene. It is interesting that he doesn't mention Longquan, a well-known sword making center not far from Hangzhou. References to this region as a sword production center of note go back even further. The Book of Han (漢書), a history of China finished in the year 111 A.D. mentions large iron deposits on the Yunnan/Sichuan border region that attracted men from afar, and made many a craftsman and trader rich: Zhuo Wangshun remarked: "...I have heard that under the marshland at the foot of Minshan Mountain there is a large deposit of bog iron. One can live one's entire life without being hungry." .3 He went on to settle in Lingqiong and dominated the trade in iron among the Dian (in Yunnan) and Shu (in Sichuan). At his height, he has 800 men working for him. Yunnan is still known today for its significant deposits of copper (used traditionally for coins) and iron. 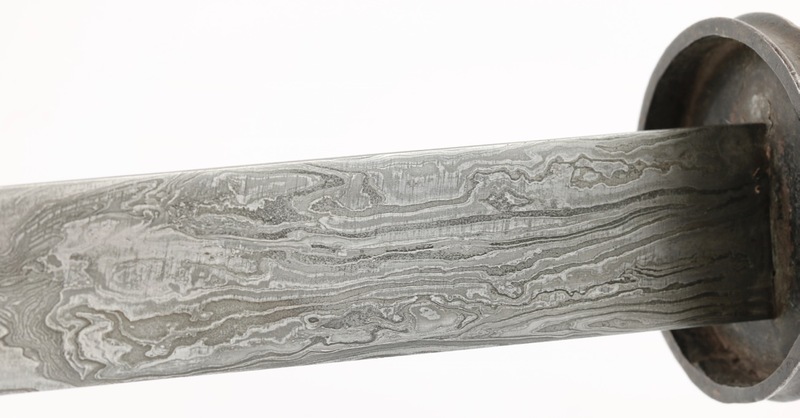 An image starts to arise of production of all kinds of swords in Yunnan, including fancy ones, made with export to neighboring regions in mind. They combined styles that could be recognized by their target markets: Chinese, Tibetan, Burmese, etc. This may explain that the aforementioned group shares characteristics that are hard to pinpoint to a single region. 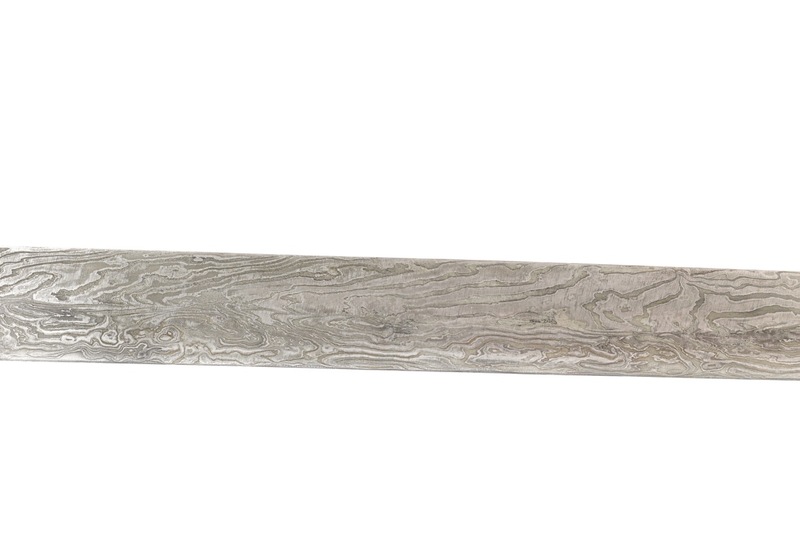 More research is needed, but I would like to draw a tentative conclusion here that the sword in question is quite likely made in Yunnan or Sichuan, possibly on commission for a well-off buyer elsewhere. 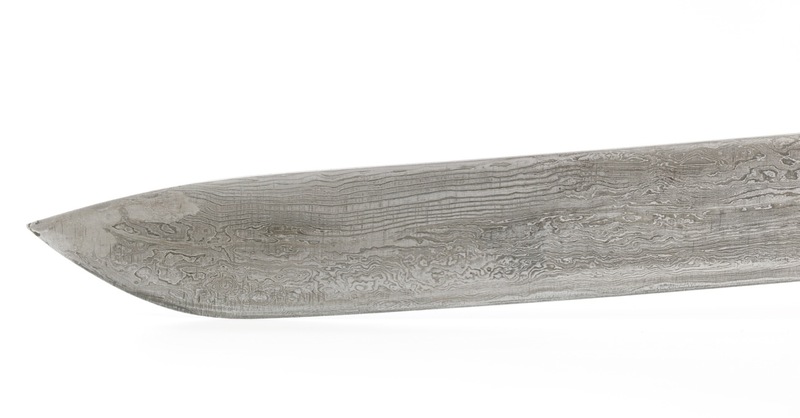 An impressive zhibeidao with high quality pattern welded blade, exhibiting some of the boldest and most unusual pattern welding I've seen on an antique sword to date. 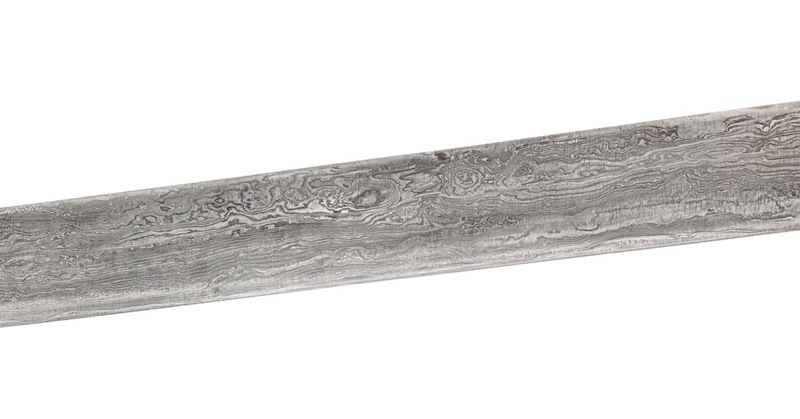 It shares some common features with a number of other swords that may point towards origins in Sichuan or Yunnan where Tibetan and Chinese styles merged. 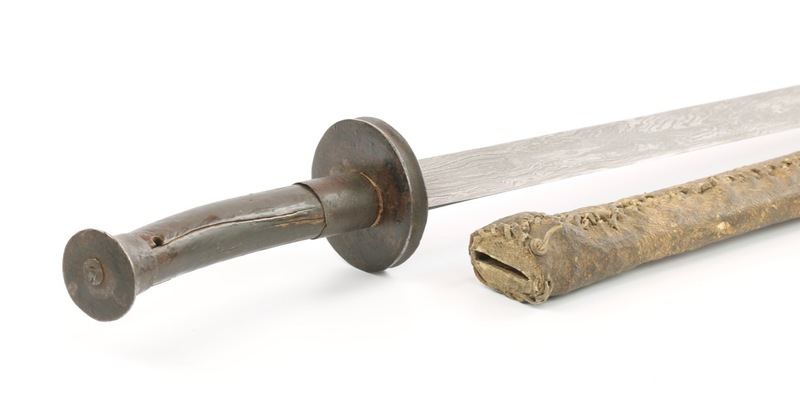 A great addition to any notable collection of antique Chinese arms. 1. E. N. Bell. I.C.S. ; A monograph on Iron and steel work in Burma , Rangoon, Superintendent, Government Printing, Burma, 1907. 2. Nicola Di Cosmo (editor); Military culture in Imperial China , Harvard University Press, Cambridge, Massachusets & London, England, 2009. Page 235. 3. Donald B. Wagner; Iron and steel in ancient China , Brill, Leiden / New York / Köln, 1993. Page 251.